Passionist student; renowned for sanctity and miracles; born at Assisi, 1 March, 1838; died 27 February, 1862, at Isola di Gran Sasso, Province of Abruzzo, Italy; son of Sante Possenti and Agnes Frisciotti; received baptism on the day of his birth and was called Francesco, the name by which he was known before entering religion, educated at the Christian Brothers' School, and at the Jesuit college at Spoleto. Immediately after the completion of his secular education, he embraced the religious state; on 21 September, 1856 he was clothed with the Passionist habit, and received the name of Gabriele dell' Addolorata. He made his religious profession on 22 September, 1857, and then began his ecclesiastical studies as a Passionist student. He was gifted with talent of a higher order and with a wonderful memory; and in his exact observance of rule, his spirit of prayer, and his fervent devotion to the Passion of our Lord, to the Holy Eucharist, and to the Dolours of the Blessed Virgin. In the sixth year of his religious life he died of consumption; his death was that of the just, holy and edifying, and he was buried in the church attached to the retreat at Isola di Gran Sasso where his remains are still entombed, and where numerous prodigies have been wrought, and numerous conversions effected, through his intercession. Little was known of Gabriel's extraordinary spiritual gifts during his life. He was not singular, he conformed himself to the community life; he was only a fervent and exemplary Passionist novice and student hidden from the world in the cloister. 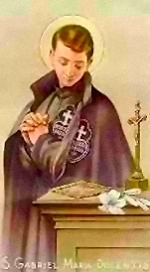 After death, this young religious in a few years was declared venerable by the Church, thereby testifying that he had practised all the virtues in a heroic degree; and he was beatified and raised to the honours of the altar, by special privilege of the supreme pontiff before he was fifty years dead. His solemn beatification took place on 31 May, 1908, in the Vatican basilica, in the presence of the cardinals then in Rome, of the Passionist fathers resident in Rome and of representatives from all the provinces of the congregation. Among those present were many who had known the beatified during his life, including one of his brothers, Father Norbert, C.P., his old spiritual director and confessor and Signor Dominico Tiberi, who had been miraculously cured through his intercession. Gabriel was canonized by Pope Benedict XV on 13 May 1920. St. Gabriel of Our Lady of Sorrows is a patron of the youth, and especially as the patron of young religious, both novices and professed, in all that concerns their interior lives.